Les Arts Florissants have gone the way of so many other ensembles (including the London Symphony Orchestra, Glyndebourne and the Mariinsky) in establishing their own recording label. We should be glad that they have done so, not only because the performance captured here is so good, but because they pull off the whole thing with such panache, style and élan that the set is a visual as well as an auditory treat. Christie and Les Arts Florissants are one of the most trusted teams in early music - so far as that term has any meaning - and the conductor has made an astute choice for their first edition on their own label. 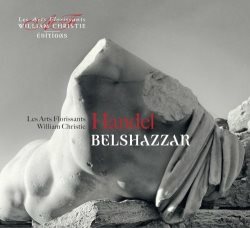 Belshazzar is not one of Handel’s better known oratorios, but it’s a magnificent piece, full of excellent music as well as lots of dramatic flair. Most interesting of all is the role of Nicotris, Belshazzar’s mother, who struggles between her faith in God and her wish to protect her son. Handel also creates plenty of coups de theâtre for the chorus, whose role here is absolutely vital, and the constantly varying dramatic structure keeps the whole thing going brilliantly. The climax comes with the appearance of the writing on the wall, when Handel conjures up all of his most evocative dramatic powers to depict first the hand and then Daniel’s eerie interpretation of the words. This studio recording came straight after some live performances at the Salle Pleyel in Paris, so the whole crew know their roles inside out and this comes across in the recording. Allan Clayton doesn’t have a huge amount to do as Belshazzar himself. His warm, bright tenor sounds almost heroic at times, so that his first, jovial aria doesn't quite fit with the image of the doomed, hubristic Babylonian king. However, as the work progressed I warmed to the way Clayton uses his vocal colour and agility to suggest the king's impetuosity and lack of discipline. He does this very effectively, nowhere more so than in his aria Let the deep bowl, just before the hand appears with the writing on the wall. Then he veritably spits out his command to bring the soothsayers to read the writing, and I loved the frenzied busyness of their subsequent entry music. His final, brief appearance is effectively a mad scene, and Clayton does it full justice. As his mother, Rosemary Joshua captures all of the character’s contradictions and traumas. She gives a poignant, searching account of the opening recitative and aria and is in impressive command of the coloratura depicting the "furious driving wind" in The leafy honours of the field. Her repeated poignancy gives way to reconciliation with Cyrus in the final act, bringing about a very satisfying duet with Caitlin Hulcup, which is a highlight of the set. Hulcup herself is business-like in her first aria and, great as is the music for her subsequent accompagnato, her take on it was a tiny touch insipid. However, she is agile and impressive for Cyrus' aria as he prepares to attack the city. There is an inspiring nobility to her aria O God of truth, as Cyrus advances on Belshazzar. She also gives a thrilling rendition of her last act arias. Iestyn Davies is predictably superb as Daniel. He sings his opening aria remarkably quietly, teasing out its meaning and drawing attention to mankind's need to submit to divine providence. A similar sense of devotion permeates his contemplation of God's word in O sacred oracles of truth. He is brilliant in the interpretation scene, and his third act aria Can the black Æthiop change his skin has a mocking touch to it, dispelled in his noble rendition of the final hymns of praise to God. I've never taken to Jonathan Lemalu's voice with as much enthusiasm as others – to me, the gravel in the voice undermines its beauty almost fatally – but I admit he makes a fair fist of the role of Gobrias. His opening aria, eulogising his lost son, is rather beautiful, and his brief aria in the final scene is compelling enough. The orchestral playing is top notch throughout. The characteristic Les Arts Florissants sound is on full display, full of pungent winds, lithe strings and a vigorous approach to rhythms. Listen, to give one example, to the busy basses in the allegro section of overture, combining Handel's contrapuntal rhythms with an unmistakably French sense of style. The chorus are fantastic throughout. They bounce their way through the first chorus of Babylonians deriding Cyrus' efforts at a siege. They bring appropriate hymn-like solemnity to their frequent contemplations of divine justice and mankind's place in the divine scheme. They are very powerful in the great chorus Recall, o King, when they warn Belshazzar against using the sacred temple vessels, and the unaccompanied opening section is particularly compelling. They are at their finest in the multi-faceted passage at the start of Act 2, where chorus and semi-chorus alternate to marvel at Cyrus' achievement in diverting the Euphrates, and in the hymns to Cyrus at the end of Act 2 and start of Act 3. Presiding over the whole thing, Christie brings his typical attention to detail to bear on everything and allows the whole thing to breathe naturally and to progress full of life. The project was his idea, and he ought to be congratulated on bringing it to fruition so successfully. The final, important selling point is the packaging. Christie states in the booklet that his aim was to provide “not only pleasure to the ear but also to the eye”, and he does so in a beautifully presented package that includes a neat concertina box for the three CDs. The booklet is lavishly illustrated with colour pictures and includes a scholarly introduction to the work, some words from Christie about the genesis of the label, the synopsis, libretto and cast biographies, all given in both English and French. As an additional extravagance, there is also a whole additional booklet containing a text from Jean Echenoz, giving his own take on ancient Babylon, drawing on both Herodotus and the Biblical story. How heartening it is to see someone still doing this in our digital age. Yes, you could download it; but don’t. Shell out for the physical product and you won’t be disappointed.